This first report of 2019 has, on the face of it, findings that suggest "business as usual" in a market long plagued by weak supply in response to strong demand. 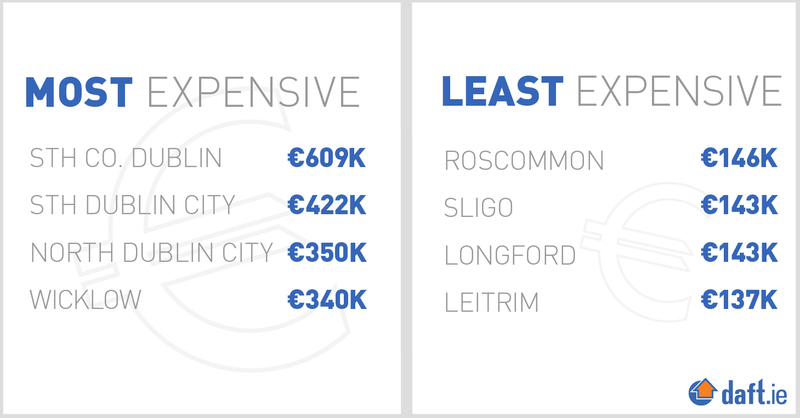 All fifty-four markets &dash; 25 parts of Dublin, the four other cities and the remaining 25 counties &dash; had an average price in the first quarter of 2019 that was higher than three months earlier. In fact, if anything, you might think the problem is getting worse: this is the first time since the middle of 2016 that every single market in the country saw prices rise and only the third time this decade. What went wrong, you might wonder? This is almost certainly a seasonal thing. As pointed out in the commentary in the last sales report, the nitty-gritty of the Central Bank mortgage rules has accentuated the hot-and-cold seasonal nature of the housing market. Historically, it used to be the case that early in the year and then again in the early autumn, the housing market would pick up &dash; only to be followed in each case by the summer and Christmas lulls. The Central Bank rules around exemptions to loan-to-income restrictions are based on the calendar year, not a rolling year. This means that it is in the interests of both borrowers and lenders to wait until January. The result is a market that is getting used to, at the risk of slightly over-simplifying, a once-a-year jump in prices in the first quarter, after which the market treads water, waiting for a new batch of exemptions. Of course, it needn't be like this at all. One small tweak in the rules &dash; to a rolling-year basis &dash; would mean that January is just another month for borrowers and lenders. What, then, should we make of the early-year jump in housing prices? The more helpful place to look is the year-on-year change. This strips away such seasonal effects by comparing similar market conditions. Nationally, the average increase in prices was 5.9% in the first quarter of the year, up from 5.5% late last year but well below the average of 10% seen in 2017. So inflation is still well above healthy levels &dash; in a healthy market, housing inflation would be in line with inflation in general consumer prices, which is zero. But it has cooled off quite a bit in the last two years. Where will it go next? As Yogi Berra would say, it's tough to make predictions, especially about the future. But regional differences can shed some light. One thing worth noting is that inflation in Dublin is well below rates seen elsewhere. 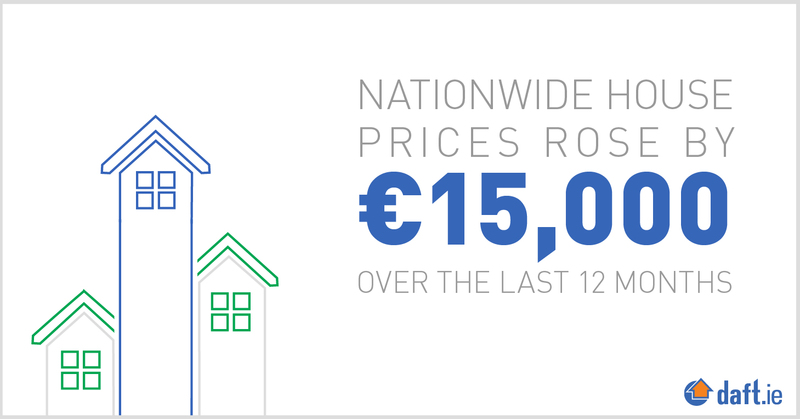 In Dublin, prices are 4.1% higher than a year ago, while the average for the rest of the country is 7.1%. What is happening in Dublin that's not happening elsewhere? The answer is supply. To make predictions, patterns from the past can help. 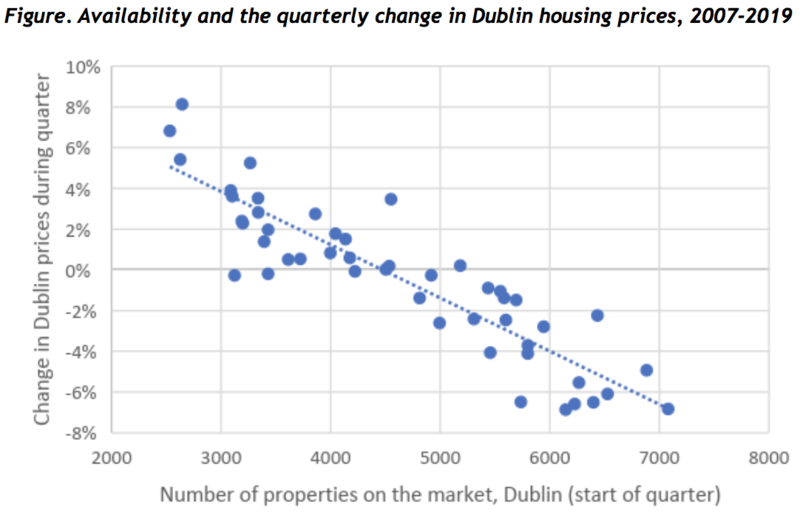 The graph accompanying this piece shows a scatterplot of availability on the Dublin market and the change in Dublin sale prices, for every quarter from 2007 to 2019. There is an extremely strong correlation between the two: if there are very few properties on the market on the first day of any given quarter, then it is very likely that prices will increase that quarter. 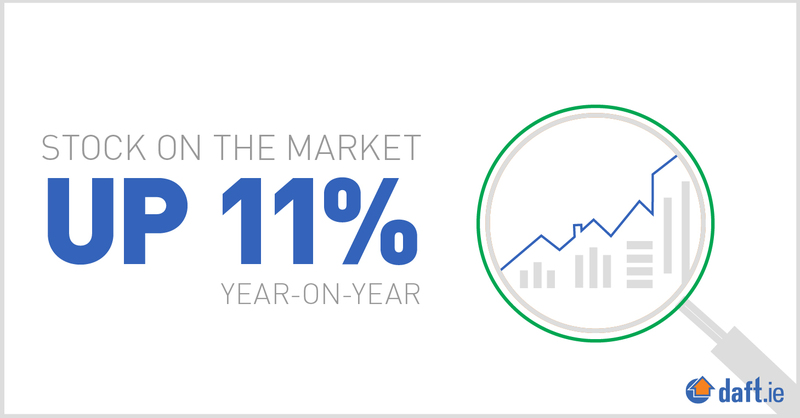 When there were just 2,500 properties on the market, sale prices rose by 5% or more â€“ in just three months. And when there were 6,000 homes or more on the market, prices fell strongly in the following three months, often by 6% or 7% in 13 weeks. The point of balance looks to be around 4,500 homes. When there is this number of homes on the market, the figures suggest, there is no strong pressure on prices up or down. By coincidence, there were almost exactly 4,500 homes for sale in Dublin on January 1st this year. While prices rose by 3.5%, it is likely that this is a seasonal outlier. As long as supply is at least this level, the market will have more than enough to go through and there should be little or no upward pressure on prices in Dublin over the rest of the year. For the rest of the country, the picture is a little different. 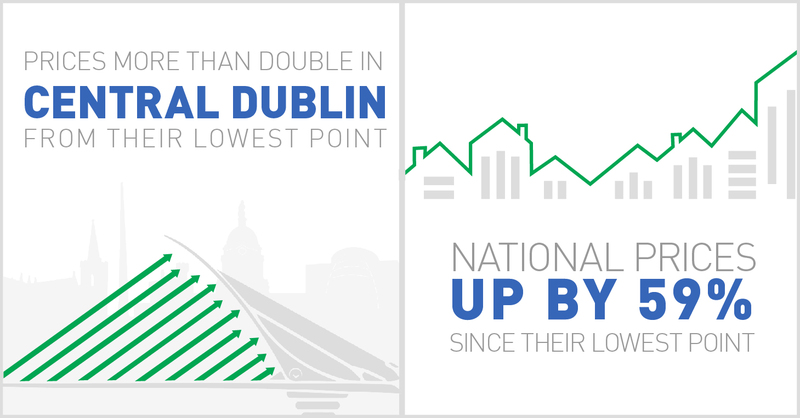 While availability is up 40% year-on-year in Dublin, outside Dublin the increase is just 5% and that is being driven by Leinster (and the other cities). Unfashionable as it may be to say this, housing prices are the result of demand and supply. To cool down inflation elsewhere in the country, new homes will need to be built.